Austrian law – how does it work? Laws are based on codes and statutes. The Austrian legal system is a civil law system. Civil procedure is designed as an adversarial process with inquisitorial elements. The proceedings — and the judge — are to a huge extent bound by the arguments put forward by the parties. The judge is not a mere “referee”, however. For example, the judge is the primary interrogator of parties and witnesses. Only after the judge has finished his/her examination, the parties have the right to examine/cross examine the witness. The oral hearing is a fundament of civil litigation proceedings. As opposed to other jurisdictions, written witness statements or affidavits are – with some exceptions – not permissible. Furthermore, the courts on first level are generally not permitted to reach a decision based solely on written submissions. A public hearing is obligatory. In the hearing, the judge will determine all relevant facts of the case, and will examine the parties and witnesses. The court will discuss the content of documents and, if necessary, appoint and hear expert witnesses. The parties and lawyers are next entitled to examine and cross-examine witnesses and experts. The underlying idea of this principle is that the judge should get an immediate and personal impression of the parties and witnesses, and consequently of the case. 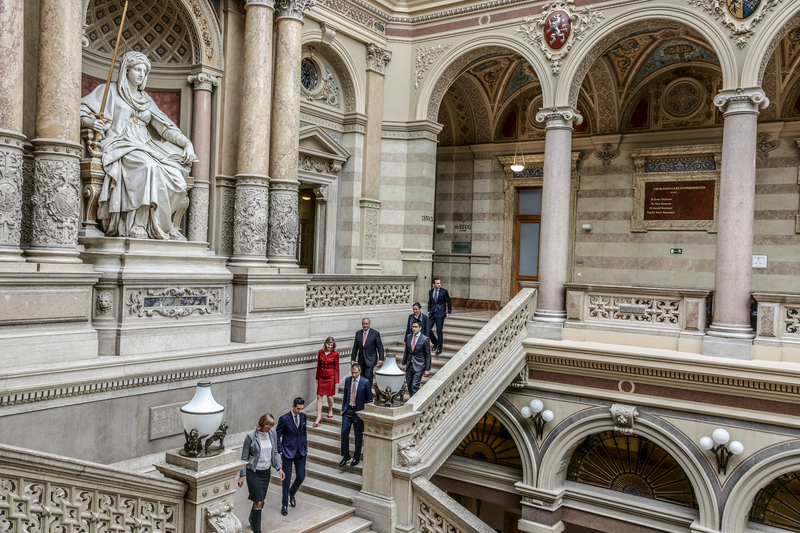 How are Austrian Courts organized? District Courts are the courts of first instance for cases with a maximum amount in dispute of EUR 15,000 and, regardless of the amount in dispute, for certain categories of cases (mainly family and tenancy law). Regional Courts have jurisdiction for first-instance rulings on all legal matters not assigned to District Courts. In addition, they rule on appeals against District Court decisions. Higher Regional Courts are appeal courts for decisions by Regional Courts. Commercial matters are decided by commercial courts. When the court presides over a matter in the formation of a panel, lay judges who have a commercial background will assist the chair of the panel, who is a professional judge. Vienna has both a Commercial District Court and a Commercial Regional Court. Elsewhere, the Regional and District Courts also function as commercial courts. The court of last resort is the Supreme Court. No further (domestic) remedy is possible against its decisions. It is charged with ensuring the uniform application of law throughout the nation. Decisions of the Supreme Court are only binding with respect to the individual case. However, they have a guiding function for other similar cases. The case law of the Supreme Court serves as a factual precedent. Austria is rather restrictive with granting access to court proceedings. First of all, court filings are not public. On top of that, judgments are rarely rendered orally. The public, i.e. parties without an individual legal interest in the matter, cannot get access to the court file. Only leading decision are published, after the names of the parties have been redacted. The reason is mainly to create enough case law for orientation purposes, but not to publish the decision in the individual matter. In contrast, hearings are open to the public. In civil matters, public access is hardly ever restricted. This may happen if, for example, it is deemed necessary so as to maintain public order, protect certain sensitive information (such as banking secrecy, business or state secrets), or if the hearing deals with confidential family matters. Due to the importance of the oral hearings, judges are rather reluctant to grant a motion to exclude the public. If the media is interested in a civil matter, it is common practice to even have a “live ticker” right out of the court room distributed by a newspaper via the internet, informing the public in detail about the conduct of the proceedings. Legal costs are – at least to a certain extent – recoverable. The principle that “the loser pays” is applied. Every party is required to pay its own legal costs during the proceedings. At the end of proceedings, the court will make a decision on costs, generally ordering the unsuccessful party to compensate the other party. Legal costs and fees consist of court fees (to be paid by the plaintiff when filing a claim or appeal), lawyers’ fees and actual expenses such as expert/translator costs and travel costs of witnesses. The parties’ own costs, such as internal investigations costs or the costs to prepare the proceedings, are not considered as reimbursable. Lawyers’ fees that can be reimbursed are set by a fixed tariff, depending on the amount in dispute and the procedural steps taken by the lawyer. The actual fees that a lawyer charges a client often exceed the tariff. Consequently, the winning party may still end up having to pay an amount greater than the reimbursement awarded according to the tariff.